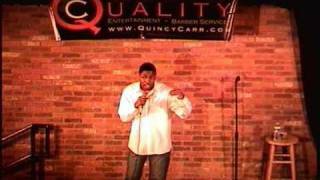 Quality Comedy w/ Quincy Carr Show Quincy Carr (Host) - Creator of “The Quality Comedy Series”, a.k.a. “The Funniest Man You Don't Really Know… Yet!” This veteran comedian / actor can be seen on the Discovery ID channel in “Wicked Attraction” and “Happily Never After”. He also opens for Queen of comedy 'Sommore' throughout the year; and is preparing for his debut role in the new romantic comedy film 'Employee of the Year' with Synergy Cornerstone Entertainment. Keep an eye on your calendar and don't miss out as this young, polished, and on-the-go entertainer performs near you… See more on www.QuincyCarr.comFeaturing CLEAN comedians Lamont Ferguson, Kim Howell, and Joseph DePaul!